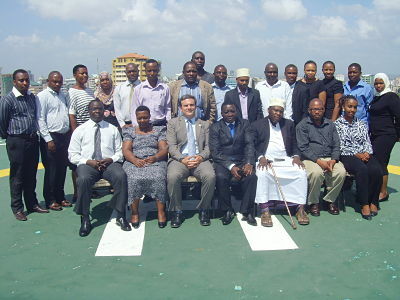 DAR ES SALAAM, TANZANIA – From March 19 to 21, 2014, the Auschwitz Institute for Peace and Reconciliation co-organized a seminar on genocide and mass atrocity prevention for twenty Tanzanian government and civil society leaders. Participants included members of the Tanzania National Committee for the Prevention of Genocide, War Crimes, Crimes Against Humanity, and all Forms of Discrimination, representatives from grassroots peace committees, and officials from the Center for Foreign Relations, among other organizations. The training was the first in a series to be conducted by AIPR in Tanzania in 2014 and 2015 to bolster capacity building towards genocide prevention at state and community levels. The March 2014 training was organized under two themes: understanding and preventing genocide and mass atrocities, and fostering partnerships in genocide and mass atrocity prevention. 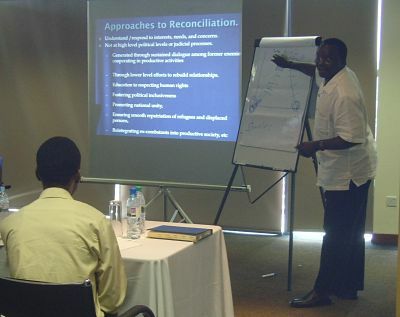 The objectives were: 1) to familiarize participants with the genocide and mass atrocity crimes, the processes by which they occur; 2) empower participants with practical competencies (knowledge and skills) to be able to identify, deter and limit the potential or impact of genocide and mass atrocities; and 3) strengthen the capacity of leaders to become agents to mainstream prevention in government policies and community programs. Instructors included Mr. Joseph Stefanelli, Legal Officer and Special Assistant to the President at the United Nations International Criminal Tribunal for Rwanda, Ms. Onyinye Onwuka, Program Officer, Early Warning Directorate, ECOWAS Commission – Nigeria, plus AIPR’s Director for Africa Dr. Ashad Sentongo. The participants stated that the program strongly met their expectations, and majority of them indicted that they gained ideas and skills they can use to implement prevention of genocide, and learned new approaches to understanding violent conflicts for them to help people better. All of them indicated that the program substantially enhanced their professional expertise and they would strongly recommend it to other state and civil society leaders.